Two weekends ago we received another wave in what has been an unusually frequent series of snow events. I’m sure my northern (and Patagonian) friends are not impressed, but at our middlin’ latitudes snow falls rather infrequently and rarely sticks around for long when it does. This winter has been different, with snowfall almost every week, it seems like, and temperatures that have remained cold enough to keep it around for awhile. 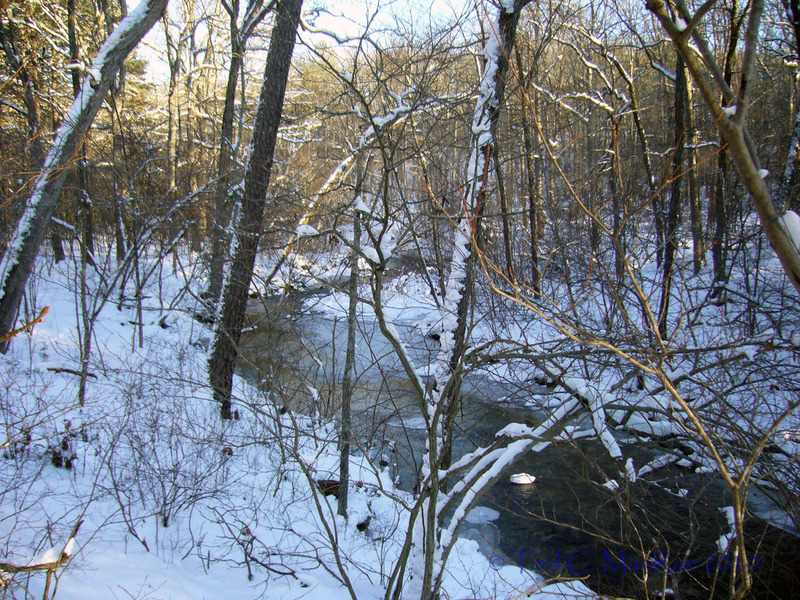 While this latest snowfall measured only a modest 1-2 inches here in the St. Louis area, a 7-inch blanket (as measured by my hiking stick) fell in the Ozark Highlands just south of here. Coming as it did at the start of the weekend, I welcomed the opportunity to go for a hike — among my favorite wintertime activities — in a landscape that is rarely seen covered in deep, newly-fallen snow. 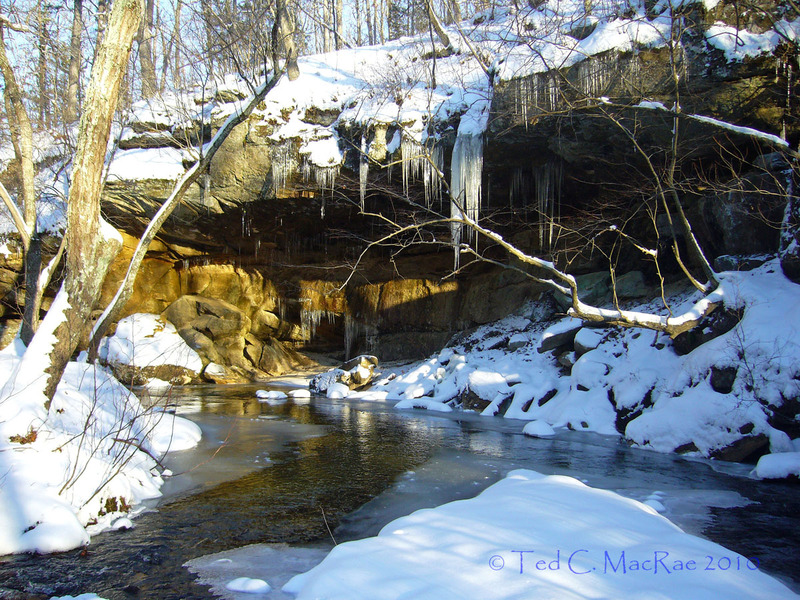 My daughter Madison loves hiking as much as I do (even in deep snow), so the two of us headed off to perhaps my favorite of Missouri’s public areas, Hawn State Park. I have long adored Hawn for its premier hiking, facinating geology, and unusual flora, and everytime I visit Hawn I find something new to love about it. Such was the case on this visit, when Madison and I decided to explore the White Oaks Trail, a newer trail that I had not yet hiked. I was a little concered whether we would even be able to get to the park, as the road leading into it had only been partially plowed (and we had already seen one car off the road, causing me to reach down and switch on the 4-wheel drive). Most of the park was snowed in, but we were able to reach the uppermost parking area, leaving our snow-covered trail-finding abilities as the last obstacle to overcome. After studying the trail map and looking at different route options, I asked Madison if she wanted to hike 2 miles, 4 miles, or 6 miles. She immediately blurted out “6 miles!”, so off we went. I was disappointed to see that we were not the first persons to have the idea, as we entered the trail only to find two sets of footprints (one human, one canid) leading off in front of us. It did, however, make following the trail easier, and in fact I’ve had enough experience finding trails through the Ozark Highlands that I never felt like I needed the footprints in front of us to point the direction. 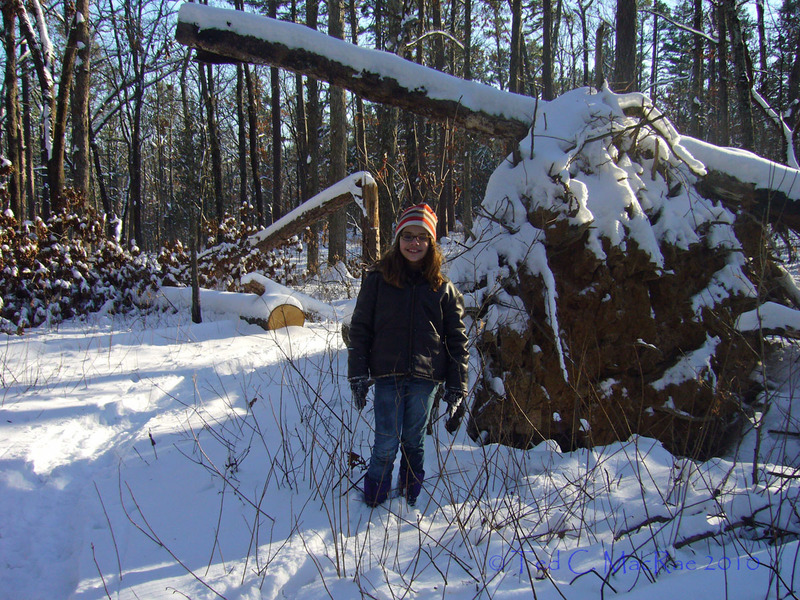 Madison next to the root wad of an 83-yr old wind-thrown oak tree. The White Oaks Trail followed nicely up-and-down terrain through mature white oak (Querucs alba) (appropriately) upland forest dissected by small riparian valleys before settling into relatively mild terrain through monotonous black oak forest. Just when I thought the trail wouldn’t match the splendor of Hawn’s Whispering Pines and Pickle Creek Trails, it wrapped around to the south at the far end and passed by a beautiful hoo-doo complex of Lamotte sandstone outcroppingss supporting majestic, widely-spaced, mature shortleaf pines (Pinus echinata). The rock outcrops provided a perfect spot to break for lunch while looking out on the deep, snow-covered valley in front of us. More Lamotte sandstone exposures along Pickle Creek, Whispering Pines Trail. After counting a cut, wind-thrown black oak (Quercus velutinus) and determining a lifespan of 83 years, we took a connector trail down to the Whispering Pines Trail where it ran alonside the incomparably beautiful Pickle Creek. Our hope was to hike down to the igneous shut-ins, where hard, pink rhyolites channeled the creek’s clear, spring-fed waters through narrow chutes and miniature gorges. Upstream from the shut-ins, Pickle Creek runs lazily through the softer Lamotte sandstones that overlay those ancient rhyolites, combining with the snow cover to create a scene as peaceful and serene as any I’ve ever witnessed. Pickle Creek meanders lazily through Whispering Pines Wild Area. 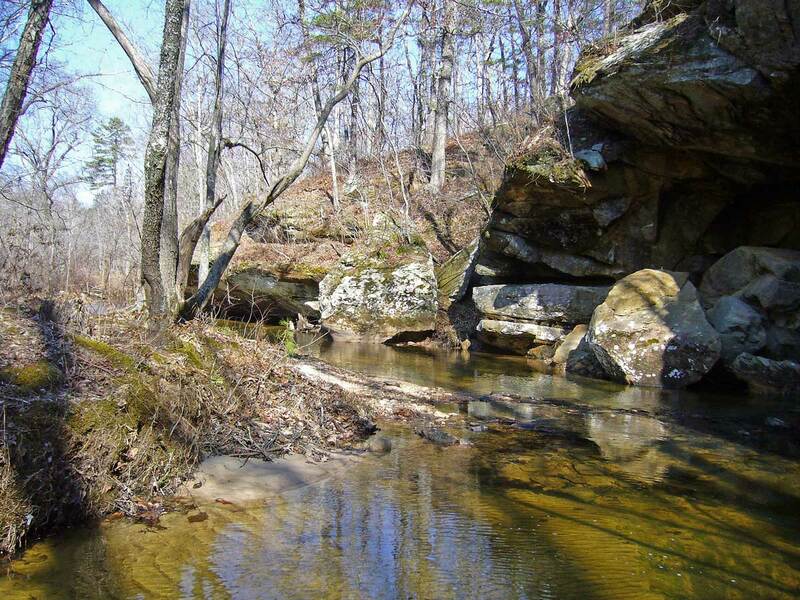 Just above the shut-ins, Pickle Creek bends to the west, carving deeply into the soft sandstone. The porous nature of the rock allows moisture to trickle through and between the strata from the hillside above, creating seep zones that weaken underlying layers and lead to their collapse. The abundant moisture this winter and continuous cycles of daytime thawing and nighttime freezes have resulted in extraordinary ice formations along the bluff face and underneath the overhanging layers, the likes of which are rarely seen in our normally more open winters. Compare the scene in the first photo below with that in the second, taken at almost exactly the same spot one year ago in February 2009. Icicle formations along Pickle Creek, Whispering Pines Trail. Same place as above in February 2009. 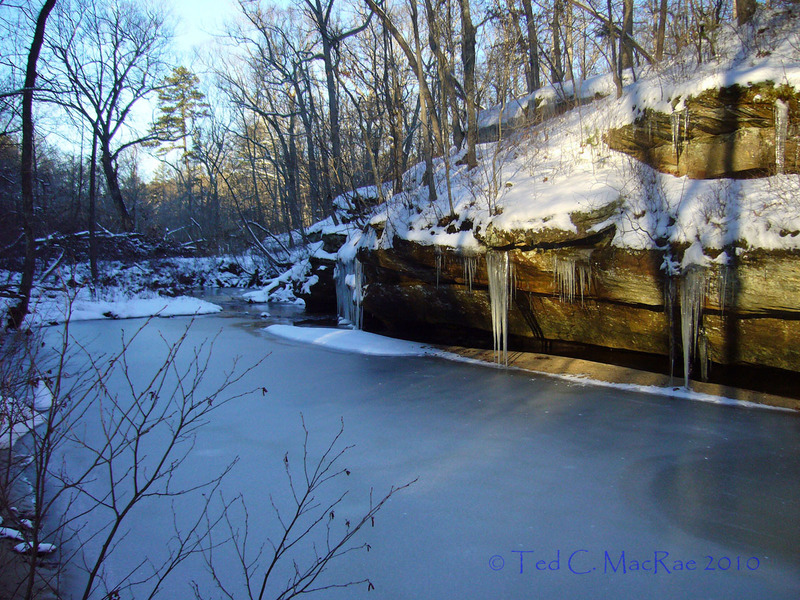 Ice rarely forms over the small ponds and lakes that dot the Ozark Highlands, much less its creeks and other moving waters. The scene below of Pickle Creek as it exits the sandstone gorge is a testament to the slowness of its movements and the unusually consistent cold temperatures experienced during the past several weeks. Only a short distance downstream, however, these lazy waters reach the bottommost layers of the erodable sandstones and encounter the hard rhyolites below. These half-a-billion year old layers of igneous rock are much more resistant to the wearing action of water, which rushes noisily through narrowly-carved chutes before fanning out in broad sheets over smooth, steep slopes below. Pickle Creek along Whispering Pines Trail. Sadly, there would not be time to visit the shut-ins. 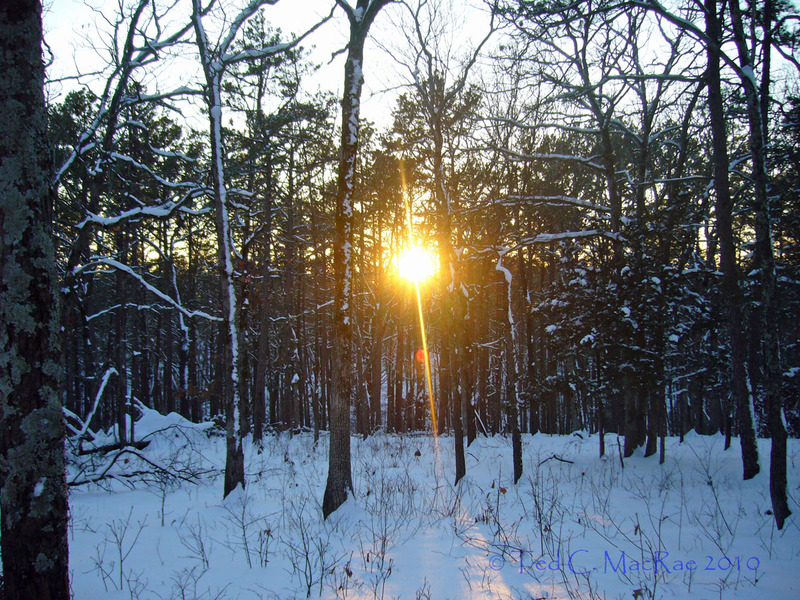 The short February day conspired with our snow-slowed pace to leave us with a too-low-sun by the time we reached the fork in the trail that led to the shut-ins, a mile in one direction, and our car, a mile in the other. Although we (both) had thought to carry flashlights (just in case), the last thing I really wanted to do was find myself stumbling over snow-covered trails through the dark with my 10-yr old daughter. Even had we survived the nighttime winter woods, I might not have survived the inevitable maternal reaction to such an escapade. Arriving back at White Oaks Trailhead with a few minutes to spare. 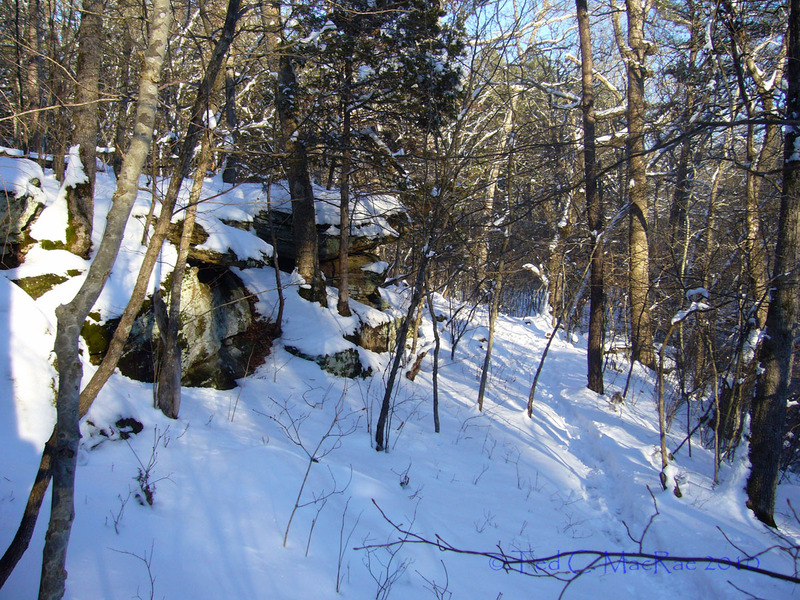 This entry was posted in [No taxon] and tagged forest, geology, Hiking, landscapes, Missouri, nature, Ozarks, science, snow. Bookmark the permalink. What a beautiful place to hike! The photos are gorgeous, Ted. Looks like a fantastic place to wander. It’s good to hear both of you had a great time. Madison sounds like a girl after your own heart: the consummate explorer. And I laughed about the maternal reaction comment. I’m especially intrigued by the difference a year makes between the two comparison images. This has been an unusual winter indeed. Even as far south as Dallas we’ve had record snowfall this season (broken several records in fact). It sure has provided a plethora of majestic scenes to behold. That little girl has always loved hiking – the first few times I took her she would go running off ahead, talking excitedly about everything she saw as she went. 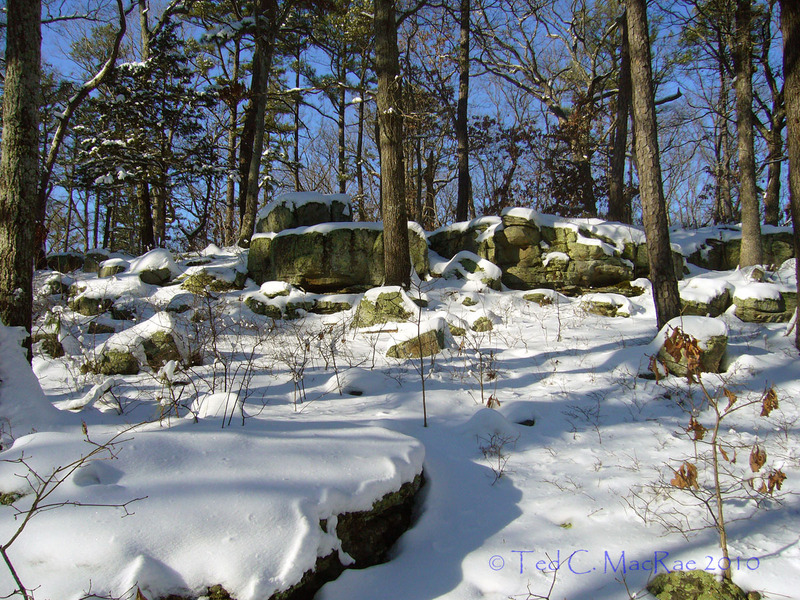 We’ve had two more snow events since that hike – I’m getting a little antsy for spring! Hi Ted, felt like I was able to hike right along with you and Madison. I love the comparison photos too! I had to look up the term, “rhyolites,” – now I know another geological term. Thanks! Oh, and I think you were especially smart to heed your anticipation of the “inevitable maternal reaction,” as it would have been well deserved had you stayed out all night! Thanks, Amber. With these hiking posts, I like to try to bring the reader along. Really nice post! Wish I’d been able to get out and hike but reading this post made me feel like I was there with you. Nice pictures as always. Thank you, Heber. I’d be interested in knowing what some of your favorite trails are in our area. Absolutely beautiful place! The comparison pictures are amazing. What a difference a year makes! Thanks, Shelly. I thought I’d gotten the comparsion photos more in alignment than I did, but there was a lot more water this time that constrained where I could stand. Still, an interesting comparison between two seasons. He is a VERY wise man … the maternal reaction would have been exactly as he envisioned … that is after I stopped hugging them when they finally made it home. It is wonderful to see these two share such special times together. I have had the pleasure of enjoying one of these hikes (at Pickle Creek – and still my favorite) and watch our little Maddie “wonder” at EVERYTHING she saw. I was truly moved at how lovingly Ted shared his knowledge – on a level that kept Madison interested and asking even more questions. Ted is in his glory with a little budding naturalist that he can help mold and direct. I LIKE it … Maternal Reaction Supreme or MRS for short … works for me!